_ A local politician came to my door a few years back, he shook my hand and asked for my vote. When I asked if he was Republican or Democrat, he said Democrat and inquired why his party affiliation would matter in a municipal election. I said that it mattered to me because most of my voting is centered on the abortion issue. Since the political platform of the Democratic Party is primarily “pro-death” on the abortion issue I don’t vote that way. And I told my politician plainly so. I honestly couldn’t think of the politically correct word, so I used "pro-death." It's the word I know to be most accurate anyway. I then said good bye to the politician and sent him on his way. I am continually amazed at the deception that surrounds the abortion issue in this country. Does he think a change in semantics will make the sin go away? _ Whose choice is it anyway, I wondered as I thought about the man’s visit. If the argument is that it’s the female’s choice, I wonder if the feelings of any of the aborted females were considered in the decision to end their lives. I have a small replica of a 12-week-old unborn baby near my computer. And I think of her often when I write for the unborn. The child can fit into the palm of my hand, but it still looks human -- complete with ten little fingers and toes. 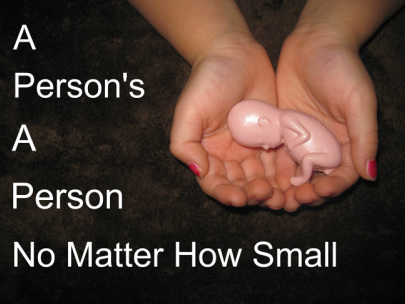 Abortions are killing nearly one out of every four babies daily in America. I remember when I was 13 weeks into my pregnancy with my fifth child; I could feel her doing flips inside of me. My doctor told me that 13 weeks was much too early to feel any movement. But, since he had never carried a child of his own, he wasn’t going to tell me what I was feeling. My daughter was alive and kickin’ in there, and she made sure that I knew it. A few years ago, Abby Johnson, a then director of a Planned Parenthood * clinic in southeast Texas was asked for the first time to assist in an ultrasound abortion. The sedated mother didn’t see her 13-week-old child squirm away from the abortionist’s probe. Nor did she see her baby crumple when the vacuum met its mark, but Abby Johnson did. The horror of it made her quit her job and join forces with the pro-life movement. As we celebrate National Sanctity of Human Life Sunday on January 22 and think on the pro-life movement this week, I encourage you to find out how you can be a voice for unborn. To find out how you can help on the local level go to www.optionline.org and use the "Find a Pregnancy Center" form to enter in your zip code. *Planned Parenthood is the leading provider of abortions in the United States.